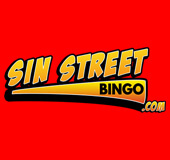 Hit the scandalous streets of Sin Street Bingo, a brand new online bingo site for 2016! 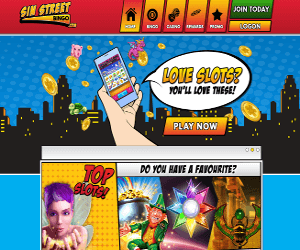 If you're ready for the most ‘scandalous place to play bingo online', then head to Sin Street Bingo! This awesome new Dragonfish site is filled with pop-art, comic book animations and pure gaming cool. You can join the main characters Rufus and Penelope on Sin Street for a sensational bingo adventure. They are ready with all the latest gadgets like selfie sticks and binoculars, to help you spin your sinful fortune. The unique and quirky site has been designed to pop perfection with eye-catching designs, super cool features and unstoppable entertainment. When you join, you can pick up a super cool Free No Deposit bonus and welcome bonus package. Then you can journey through a massive selection of online bingo, sinful slot games and side games, and chances to hit the devilish mega jackpot. When you first sign up to the sinful streets, you'll be spoilt with a £5 Free No Deposit Bonus plus 10 Free spins. Then you'll have the awesome chance to choose your deposit offer. You'll can take your pick and choose to either deposit £5 to collect a 200% bonus, £10 for a 300% bonus or £20 for a 400% bonus. Sin Street will then reward you with plenty of devilish promotions, perks and exclusive offers. These range from No Lose Bingo where if you lose you'll be refunded up to £200 to Slots Tournaments and Penny Bingo, You'll also be rewarded for sticking around with the Xcite Loyalty and Xcite VIP Loyalty packages. Other hot promotions include the Late Night show, Wow Spin-tastic and Happy Hour and the Big £10K. You can also pick up exclusive offers on the Facebook page and in the bustling chat community. Stay tuned for the latest exclusive coupon codes! Hit the playground of sin, and you can take your pick from bingo, slots, table and side games. There's plenty of thrilling 75 Ball, 90 Ball and themed 5 line bingo rooms to keep you occupied. You'll then be spoilt for choice with plenty of delicous slots with juicy jackpots, like Cleopatra, Starburst, Gonzo's Quest, Guns and Roses. Sin Street also offers progressive games like Millionaire Jackpot . Next get your thrills in the casino lounge to roll through action-packed Roulette, Poker and Roulette releases. Continue your gaming adventure wherever you are on your mobile, IOS, Android and tablet devices.